A fun, cool project is going on at the FAC Theatre! Guest Director Marc Gwinn has created an original show with many of the FAC Advanced Theatre Ensemble in it. The show is in the genre of STOMP or BLUE MAN GROUP - no text, some characters, lots of movement, the results are large works of art. 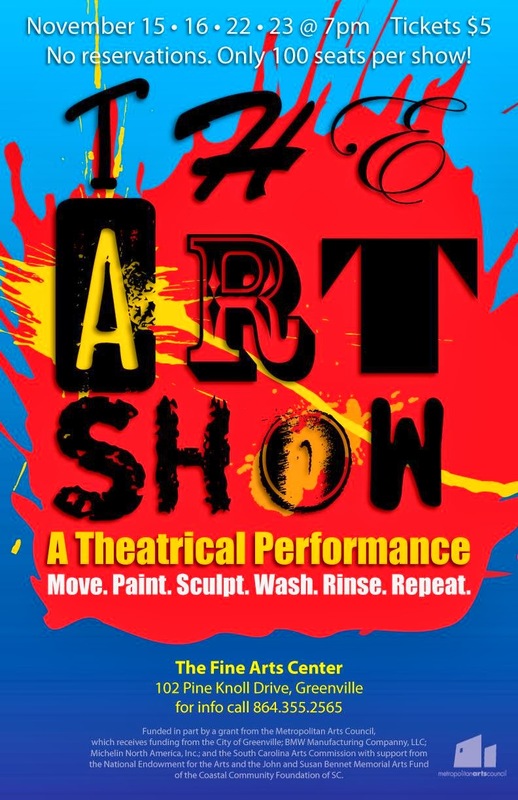 The creative team behind this project is Marc Gwinn (Guest Director and concept creator), David Simms (Director of the Arts at Christ Church Episcopal School), Katie Walker (Art Consultant and co-founder of the Art Bomb) and Teri Parker Lewis (Fine Arts Center Theatre Program). All are originally from the upstate, yet have worked across the country in their given art forms. The show is at the Fine Arts Center November 15-16 and 22-23. Tickets are $5 and seating is limited.